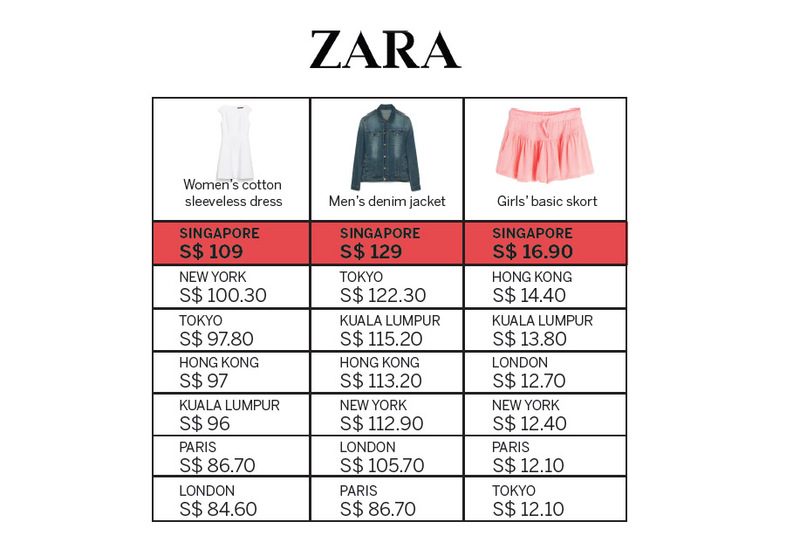 Are you paying more for Zara and Apple in Singapore? SINGAPORE - Are consumer items more expensive in Singapore than in other major cities? A study commissioned by the Monetary Authority of Singapore (MAS) and the Trade and Industry Ministry (MTI) looked into this question recently. SINGAPORE - Most savvy shoppers know that some consumer products from global brands can be pricier here than abroad. The higher prices, a survey released yesterday found, are mainly due to Singapore's small market size and the higher transport costs of bringing products here. 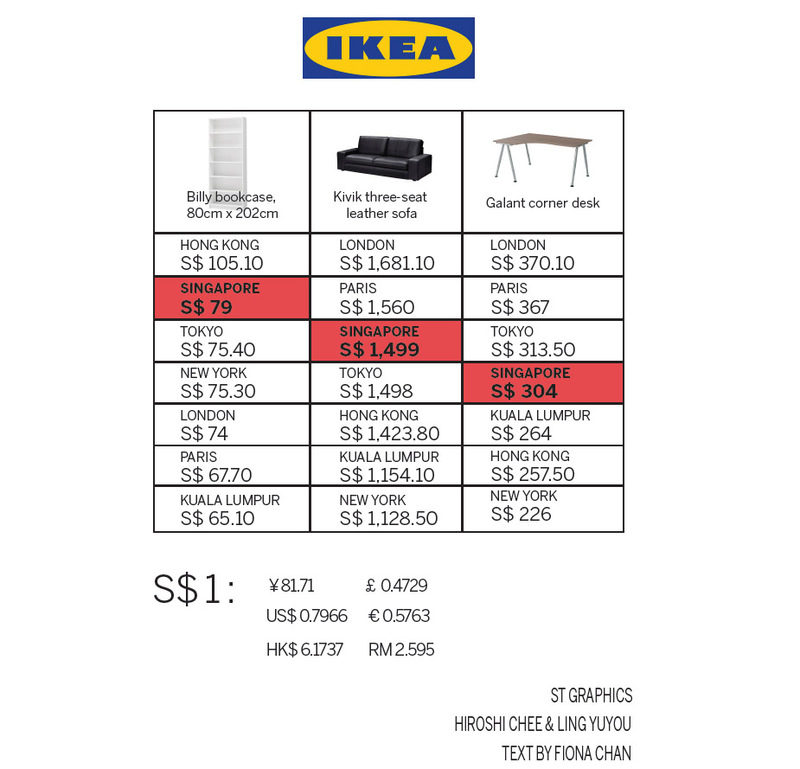 The study, commissioned by the Monetary Authority of Singapore (MAS) and the Ministry of Trade and Industry (MTI), sampled 647 products from Apple, Ikea and Zara. It compared their prices across 11 cities: Singapore, Hong Kong, Kuala Lumpur, Shanghai, Taipei, Tokyo, Bangkok, Paris, London, Sydney and New York. Prices here were above the median for two-thirds of the items and below the median mark for a quarter of them. The median is the midpoint of a range. Only 21 items were found to be the cheapest here. Still, the study pointed out that Singapore was not the priciest city overall. The Republic was the most expensive for only 6 per cent of the products sampled. The brands were chosen for the large number of identical consumer electronics, furniture and apparel products available for comparison across cities. 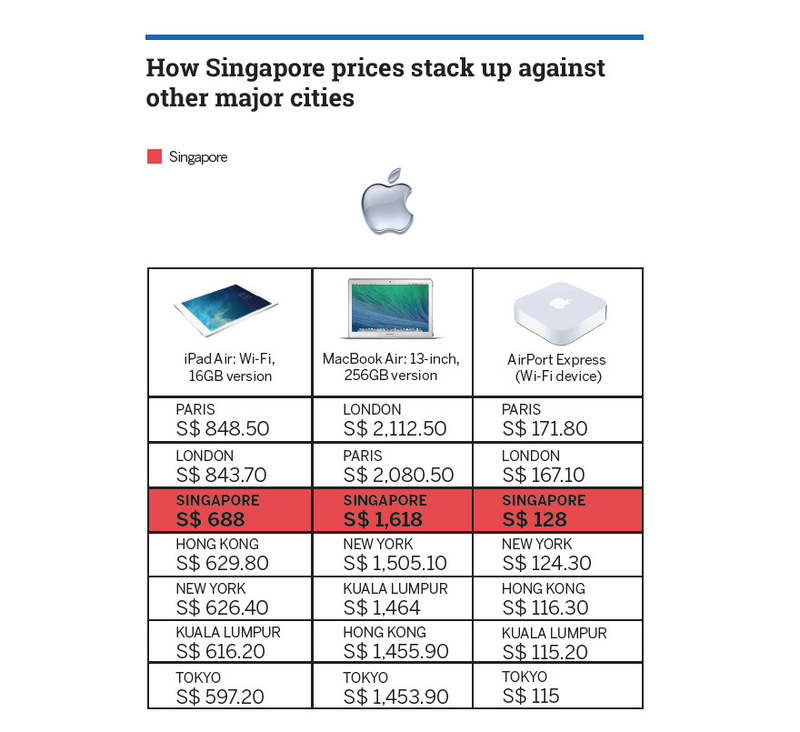 The price comparisons did not include sales taxes such as Singapore's goods and services tax. When sales taxes were taken into account, the price differences narrowed between Singapore and cities such as Paris, London and Shanghai, where sales taxes are significantly higher. The Republic's small market size is likely the main reason behind the higher prices of some goods compared with other highcost cities such as Hong Kong and New York, the study found. Pricing decisions are influenced by unit cost. Bigger markets allow retailers to spread overheads over a larger sales volume. Prices also tend to be lower in cities near the source country, as the three global brands build transport costs into prices. In setting prices, retailers take into account differing demand conditions, including the intensity of competition and consumer preferences, said MAS and MTI. Given that the study focused on only three brands, the findings should not be taken to represent differences in the overall cost of living across cities, they added. Singapore Polytechnic senior retail lecturer Sarah Lim said retailers in larger cities can take advantage of economies of scale to spread out high labour and rental costs - major bugbears in the smaller retail scene here. The Republic's modestly sized market is also unable to support many large retail players. "Competition is stiffer in markets like New York and London, where there are a lot of players... Retailers will therefore have to price (items) more competitively," Ms Lim said. If the sampled items are more popular here than in other cities, that may also affect price differences, said Singapore Retailers Association executive director Lau Chuen Wei. A more important point is that price differentials between Singapore and the 10 cities are "fairly moderate" when including sales taxes. "We use this figure because that is the real figure to the consumer," said Ms Lau. "So, for a shopper, shopping in Singapore is likely to give the best deal, all purchases considered."